Although the Facts may be true, (and at least when not, are identified as Legends) the approach to relating them is rather dated. 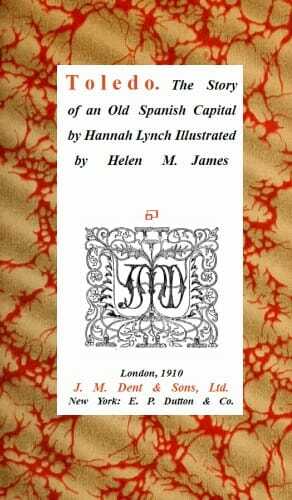 The Author, in her condescending British Upper-Crusty way, looks down on the "Quaint" and "Primitive" and "Unfortunate" Spanish of old. ​of the land are rough and crude", then describes glimpsed carters as "heavy-browed males". "Morality is, after all, like criticism, only a matter of existing convention and national temperament. Believe the right thing, and one’s vices are a matter of small account. In the mediæval times, with a proper amount of faith, one might with impunity, boil one’s enemies or roast them before a fire, and be duly canonised and offered to posterity as a saint and a just man." Nevertheless, when I know I cannot expect to remember more than ten facts from such a book, it becomes a useful recap of the general shape of Toledan history. Unlike a modern author, she dismisses geology, geography and anthropology, going only for recorded history: - "Of the town’s earliest history knowledge is merely the wildest assumption…". ​ I was fascinated to discover the city existed at the time of Hannibal, and that a local army forced him to retreat in battle, only to have him return and defeat them while they were busy celebrating the victory. She goes on to relate the times of the Romans, the Gothic kings, the Moors, and the return of Christian rule. Too much to condense here, but see below for a couple of "Bloody Tales". I had not known that the historical figure "El Cid" was the first "Mayor", or actually Alcalde (From Arabic, meaning "the judge") of Toledo in the period after Moslem rule. 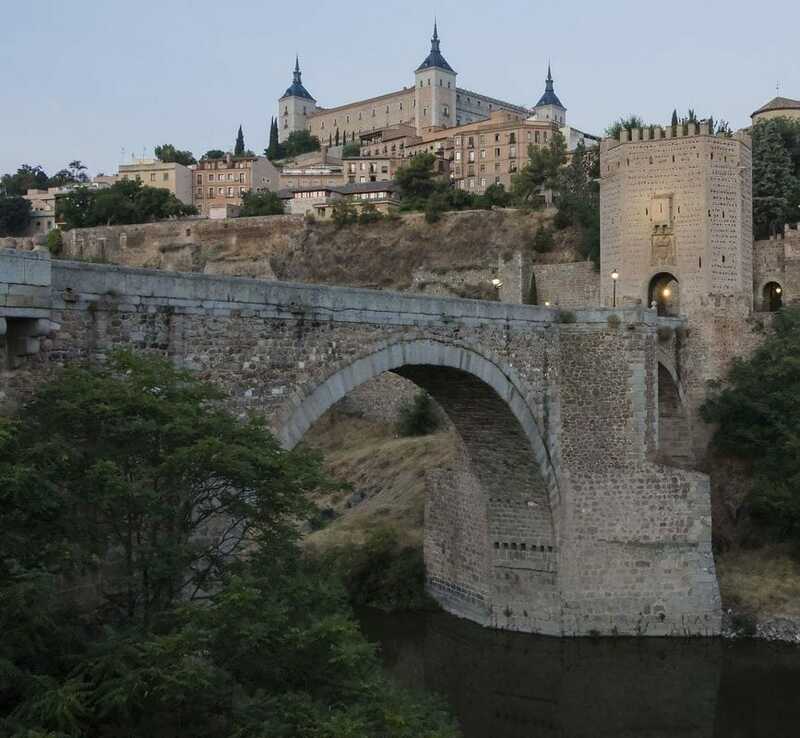 I was also surprised to learn that frequently Toledo was, or almost was, an independant city-state, or a regional or Royal capital, rather than just a walled town among many others. She elects to end her relation around 1600, saying "But henceforth Toledo is an effaced figure among Spanish towns. She is no longer the Imperial city or the Royal town, and is only a great historic memory." Now, you might think this is a bit dismissive, 300 years of history omitted as insignificant, but sadly, it is probably true. Little more has changed since the book was written, after another hundred years, as is borne out by the pictures below. At left are two sketched illustrations from the book, and at right, some modern colour photographs of 2012 and 2014. There has not been any radical change, no high-rise buildings, no new rail bridge, no new motorway sweeping down the riverbank, no fancy new dock for tourist river excursions. It looked the same when I visited 18th of May, 1996 (See my Post "20th Anniversary of Departure for TOSOTW"). The book then continues with a description of the town's various attractions and historical places, as at the time written. This I found of less interest, without the reality to consult. Although there were further tidbits of history interspersed, I skipped most of the section. I have little doubt this section would serve as a tourist guide today almost as well as when it was written, possibly better, covering things probably not as well-known or cared about today. One whole chapter is devoted to the artist Domenico Theotocopulos, "El Greco", some of whose paintings I saw while there. It would seem on this subject there has been more knowledge gained, for she says "We do not know even where he lived in Toledo, how he lived, who his wife was, if he loved her, who his friends were, what manner of father and citizen he was. ", yet in Wikipedia we find "Surviving contracts mention him as the tenant from 1585 onwards of a complex consisting of three apartments and twenty-four rooms which belonged to the Marquis de Villena. It was in these apartments, which also served as his workshop, that he passed the rest of his life, painting and studying. He lived in considerable style, sometimes employing musicians to play whilst he dined. It is not confirmed whether he lived with his Spanish female companion, Jerónima de Las Cuevas, whom he probably never married. She was the mother of his only son, Jorge Manuel, born in 1578, who also became a painter, assisted his father, and continued to repeat his compositions for many years after he inherited the studio. In 1604, Jorge Manuel and Alfonsa de los Morales gave birth to El Greco's grandson, Gabriel, who was baptized by Gregorio Angulo, governor of Toledo and a personal friend of the artist" Obviously Twentieth Century scholars have been diligent since the book was written. I found the book a fascinating, colourful and yes, bloody tale of religion, power, violence, intrigue and even trade. Another good reminder that the atrocities and abuses of power we see today are hardly new, and definitely no worse than those of the past. "…and in his [Sisebuth's] reign takes place the first of those unfortunate outbreaks against the Jews, for which dismantled and impoverished Spain still pays so heavy a price. 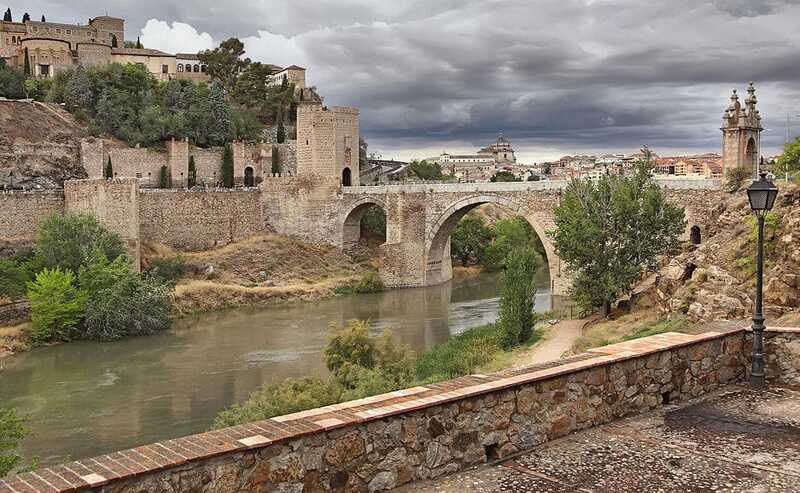 Before the Moors came, Toledo’s source of prosperity and wealth sprang from her Hebrew colony, and the anti-Semitic movement, started by Sisebuth, had probably no other object than the barbarians’ desire to appropriate Jewish gold. Sisebuth himself is spoken of in history as the father of the poor, and is extolled for his compassionate heart and his liberality. His horror of suffering and blood was so great that he sent his own doctors to tend the stricken enemy when he was compelled to go to war, and paid out of his own purse to his soldiers the ransom of their captives. Servitude and blood-shedding were equally abhorrent to him. The annalist Frêdégaire tells of him, as an example of exquisite sensibility in those rude times, which would be no less rare in our own, that in the thick of battle with the Imperial army, seeing the Greek soldiers fall in numbers under the savage blow of his men, he rushed into their midst, shouting: “Woe to me whose reign should see the flowing of so much human blood,” and frantically drove away his soldiers from the wounded Byzantines. The pity was such excellent sentiments were not cultivated on behalf of the Jews. Having twice defeated the Byzantine army, Cesario only procured a treaty of peace on condition the Jews were expelled from Spain. And in 616, Sisebuth published his famous edict against the children of Israel, offering them the harsh alternative, within the year, of professing the Christian faith, and accepting baptism, or being publicly flogged a hundred whip-strokes, shaven and shorn, robbed of their goods, and expelled from the kingdom. One hardly understands why the shaving and flogging should have been ordered, since appropriation and expulsion ought to have sufficed. Even the Fathers of the Church had the grace to protest against the needless inhumanity of this edict, though the Toledan bishops in a council upheld it. Yet history accepts him as a mild and upright judge, a magnificent prince, a valiant and humane captain, the friend of the poor, the protector of letters. He himself dabbled in literature, wrote in the swollen and exaggerated Gothic manner, composed several earnest and dogmatic letters in refutation of Arianism, which he addressed to the King and Queen of Lombardy, severely reprimanded Bishop Eusebius for the disorders of his existence, and commanded Bishop Caecilius to return to his diocese, which he had forsaken for the monastery. Clearly a monarch not to be trifled with even by the bishops, whom he kept in check, and whose public and private life he insisted on regulating." "Hakam summoned up courage to address them as their sovereign, and try a policy of conciliation. He chose for their governor a renegade Christian, one Amron of Huesca, the worst choice he could have made. “You alone can help me to punish these rebels who refuse to acknowledge a Moor for their chief, but who will perhaps submit to one of their own race,” he said to Amron, who was officially recognised as governor of Toledo in 807. The Sultan wrote to the Toledans: “By a condescension which proves our extreme solicitude for your interests, instead of sending you one of our own subjects, we have chosen one of your compatriots.” The Toledans were speedily to receive immortal proof of the special delicacy of this attention. There exists no more shameless and inconceivable barbarity in the blood-stained pages of history than this same Amron’s horrible method of cowing a haughty people. He began with the arts of beguilement, and left nothing undone to win the confidence and affection of the Toledan nobles. He feigned with them an implacable hatred of the Sultan and their conquerors, mysteriously asserted his faith in the national cause—that is Toledo’s independence—and by this was able, without exciting suspicion, to quarter soldiers in private houses. Without difficulty he obtained the town’s consent to build a strong castle at its extremity as a barrack for his troops, and then, to show their confidence in him, the nobles suggested the very thing he wanted, that the castle should be raised in the middle of the town. 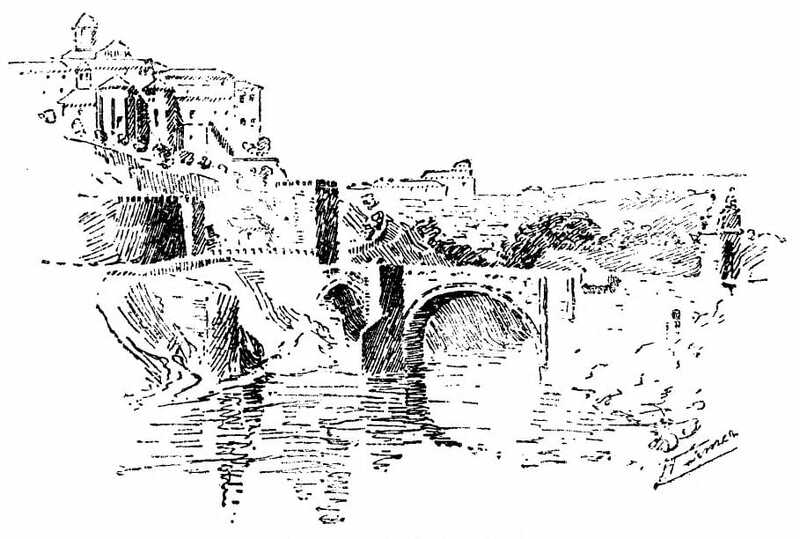 When the fortress was built, Amron installed himself therein with a strong guard, and then sent word to the Sultan, whose heart by this was well hardened against the sullen and untameable Toledans. Troops were speedily gathered from other towns, and set marching upon the royal city. The young prince, Abderraman, commanded one wing, and the others were commanded by three vizirs. Amron then persuaded the unfortunate nobles to accompany him to meet the Sultan’s son outside the walls. The nobles plumed themselves on their power and value, and gaily set out to visit the young prince, who received them splendidly. After a private consultation with the vizirs, Amron came back to the nobles, whom he found enchanted with the prince’s kindness and courtesy, and proposed that they should invite Abderraman to honour the town with his visit. The Toledans applauded the proposition to entertain a prince with whom they were so satisfied in every way. They had a governor of their own nationality, they enjoyed perfect freedom, and Abderraman had personally won them. In their innocence they besought an honour now desired. Abderraman acted the part of coy visitor, delicately apprehensive of giving trouble, but finally yielded to the persuasion of such genial hospitality. 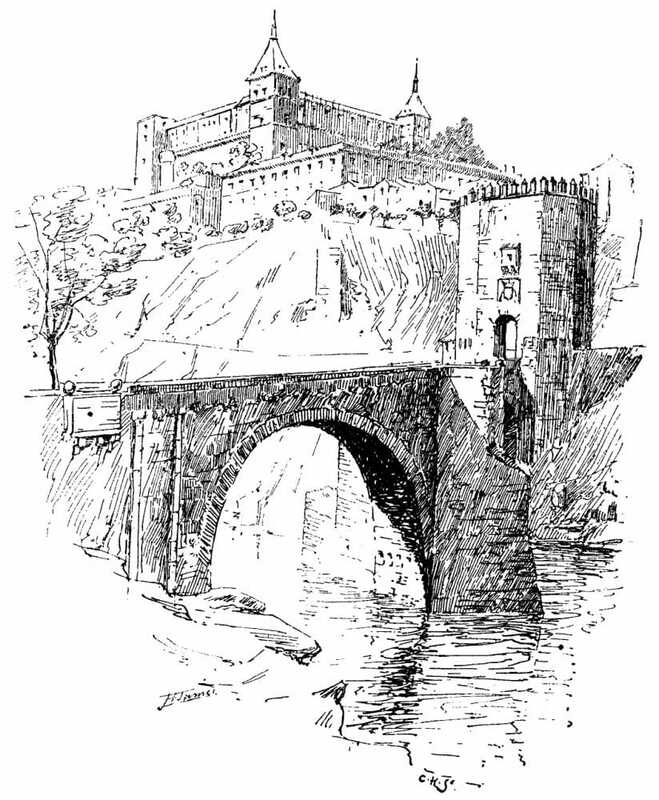 He came to the fortified castle, and ordered a great feast to which all the nobles and wealthy citizens of Toledo were invited. The guests came in crowds, but they were only permitted to enter the castle one by one. The order was that they should enter by one gate, and the carriages should round the fortress to await them at another. In the courtyard there was a ditch, and beside it stood the executioners, hatchet in hand, and as each guest advanced, he was felled and rolled into the ditch. The butchery lasted several hours, and the fatal day is ever since known in Spanish history as the Day of the Foss. In Toledan legends it has given rise to the proverb una noche Toledana, which is lightly enough now applied to any contrariety that produces sleeplessness, headache, or heartache. But only conceive the horrible picture in all its brutal nakedness! The gaily-apparelled guest, scented, jewelled, smiling, alights from his carriage, looking forward to pleasure in varied form; brilliant lights, delicate viands, exquisite wines, lute, song, flowers, sparkling speech. Then the quick entrance into a dim courtyard, a step forward, perhaps in the act of unclasping a silken mantle; the soundless movement of a fatal arm in the shadowy silence, the invisible executioner’s form probably hidden by a profusion of tall plants or an Oriental bush, and body after body, head upon head, roll into the common grave till the ditch is filled with nigh upon five thousand corpses. Not even the famous St Bartholomew can compete with this in horror, in gruesomeness. Compared with it, that night of Paris was honourable and open warfare. It is the stillness of the hour, the quickness of doing, the unflinching and awful personality of the executioners, who so remorselessly struck down life as ever it advanced with smiling lip and brightly-glancing eye, that lend this scene its matchless colours of cruelty and savagery. Beside it, few shocking hours in history will seem deprived of all sense of mitigation and humanity."